A French court has handed prison sentences of between 15 years and life to officials who served under Gen Augusto Pinochet in Chile. 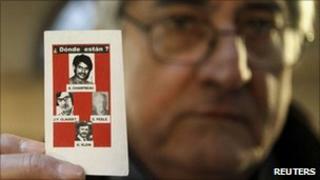 Fourteen officials were tried in their absence for the disappearance of four French citizens in the early 1970s. Two of the suspects were sentenced to life over the charges, which included kidnapping, torture and detention. Manuel Contreras, the former head of Chile's Dina secret police, was among those sentenced. Thirteen of the officials are Chilean, while one is Argentine. One was acquitted. Those sentenced to life are Juan Manuel Contreras Sepulveda, who at the time headed Gen Pinochet's police, and Octavio Espinoza Bravo, an army colonel. The four French citizens disappeared between 1973 and 1975. They include Georges Klein, a former counsellor to President Salvador Allende, whom Gen Pinochet ousted in a coup. A lawyer representing the family members, Sophie Thonon, earlier said it was important that those accused were convicted. "Of course, Chile does not extradite its nationals, but Chile will be their prison - and if they cross a border, they will be arrested," she said. Gen Pinochet was himself implicated in the disappearance of the French nationals, but he died in 2006 without facing trial. His regime, which lasted from 1973 to 1990, left more than 3,000 people dead or missing.